Poured from 12oz can into my Hillside Bar pint glass. Appearance: medium orange hue with a light haze and a strong effervescence. Head is a thick finger of frothy ivory foam. Not bad at all! Smell: quite malty with plenty of sweetness and only mild hop character. Frankly it smells a little homebrewey, or like a too-sweet European lager. Kind of a weird one for me. Taste: again, malty, but somewhat better than the aroma. The calypso hops don't seem to have a whole lot of character, but the bitterness is nice. Mouthfeel: medium body with a decent carbonation and OK creaminess. Not too bad. 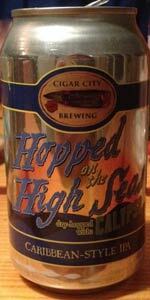 Overall: this beer just does not really resonate with me, which is a disappointment because I tend to really like Cigar City's offerings.